Redclaw the Destroyer licked her sharp teeth as she watched the line of men and wagons on the road below. She puffed a spurt of flame into the crisp mountain air and imagined the sweet taste of human blood on her tongue. Digging her claws into the high rocky ledge, she uncoiled her massive body. She enjoyed the fear her surprise attacks caused almost as much as the feast afterward. Roaring, she rocketed from the ledge and dived for the wagons and the armed guards that accompanied them. The humans looked up at the sound of her pounding wings and froze in terror as she released a fiery breath hat ignited one of the wagons. The strong boxes in the back of a second wagon promised a welcome addition to her hoard. She ripped the horses from their harnesses and flung them into the trees on the side of the road, saving them for later. She’d eat the humans first. Afterward, she’d carry the treasure to her lair, leaving behind nothing that would give away her existence in the Vingaard Mountains. Her wings whipped up a cloud of sand and pebbles as she attacked the nearest man. Her claws punctured his armor and sank into his flesh. “Redclaw!” someone called. The sound of her name rang above her pounding wings and the crackle of the burning wagon. Redclaw dropped the human and pivoted to face her unexpected opponent. A gangly fifteen-year-old boy stood in the center of the road, clutching two sharp swords that looked far too heavy for his slight frame to wield. The wind from Redclaw’s wings fanned his long dark hair. His silver eyes showed no fear. Redclaw took another step toward him testing the air for his smell, sensing the magic radiating from him. Redclaw snorted. “You are no match for me.” She sucked in a deep breath and stoked the fire in her belly. The boy tightened his grip on his swords and set his stance. “I’ve been hired to protect these wagons, and I intend to do it.” Magic pulsed from him, and a fine mist sprang up around them. “Nice spell, but a little mist won’t save you.” Redclaw released a cone of fire into his face. The boy dived to the side. A blast of wind turned the flames away from him. Thick clouds rolled together overhead, obscuring the sky. The scent of coming rain filled the air. “Run!” the boy yelled to the other humans, but the dragonfear held them rooted in place. Redclaw snapped one up in her jaws. A thunderous roar filled the air, and a sleek silver shape hurtled out of the mist, slamming Redclaw to the ground. Sharp claws scraped against her scales. Redclaw flung her attacker off and leaped into the air, shooting a cone of fire at the annoying silver dragon that had materialized out of the clouds. The silver dragon blocked her flames with a cone of cold air. Their two magics locked for a moment, then dissipated. “Sleekwing Thuderbolt, how dare you come into my territory?” Redclaw roared, drawing herself higher into the air where she could maneuver better. Below her, the humans scattered into the trees. Only the gangly boy remained on the road, his swords poised and ready to fight. and clawing at Redclaw’s belly. “That’s none of your affair.” Sleekwing dived for Redclaw’s neck. “Not if I find it first,” Redclaw rared. She clamped her teeth into Sleekwing’s shoulder, and the two dragons rolled through the air, clawing at each other. 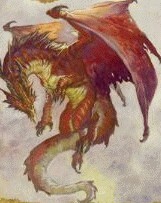 Redclaw felt the silver dragon’s wing tear beneath her back talons. Sleekwing broke away, blood trickling from her right wing. Redclaw bellowed in triumph, but Sleekwing filled the air with her paralyzing breath. As the cone of cold gas hit Redclaw, her muscles froze, and she plunged toward the ground. Jagged pines rushed up to meet her. Sleekwing roared and swooped down to finish her. Redclaw regained control of her body a few feet from the ground. She arched her wings, turning the speed from her fall into forward motion. Her claws snapped around the boy’s shoulders, and she swept him into the air with her. “No!” Sleekwing roared. Her cry echoed from the mountaintops. “It’s not over!” Redclaw bellowed to her opponent. “I will destroy you, Sleekwing.” Flapping hard, Redclaw sped away. Sleekwing tried to follow, but her torn wing slowed her flight. Redclaw soared to the safety of her hidden lair, already planning her revenge.